Giotto "Vongola I, Vongola Primo, Shodaime, Ieyasu Sawada"
The first head of the Vongola Family, to whom Tsuna bears a striking resemblance. He started the family 400 years before the start of the story. He retired early and moved to Japan, where he started a family which eventually produced Tsuna, making him Tsuna's great-great-great grandfather. 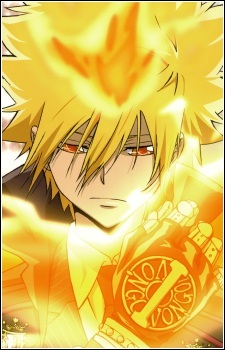 He and Tsuna both use gloves as their primary weapon,however, Giotto's gloves has an "I" engraved on it, which represents the number "1" in Roman numerals. Besides Tsuna, Giotto was the only boss who had an unorthodox family; that is, he accepted anyone he liked: kings, military men, rival Mafia members, and even religious people. Reborn said that he climbed mountains to increase his endurance so he could go into hyper dying will mode at any time.